Last week was disastrous. It began with the phone (my sketch pad), having a fatal accident and continued with me coming home from a couple of nights away to find that ginger Arthur was missing! To my huge relief he walked in the door another two days later, none the worse and apparently having simply taking himself off for a two-day camping and hunting trip without leaving a note. While in un-cat-related disasters, my lovely half-standard gooseberry snapped in two under the weight of its first substantial crop. 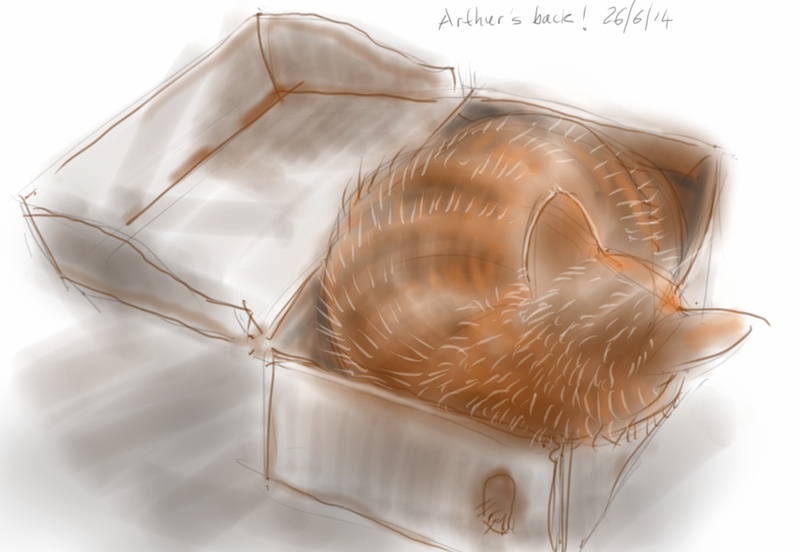 This entry was posted in Cats and tagged art, arthur, arthur cat, cat, cat drawing, cat sleeping, cat-of-the-day, digital sketch, drawing, ginger on June 26, 2014 by Nancy Farmer. So glad he is back safe and sound. I think they just like to be missed…..
you might have a point there, Wendy! He hadn’t done it since he was gone one time for nearly 24 hours when he was very young, so I was imagining all sorts of horrors when the little chap walked in bright as a button as usual! I thought he’d become more stay-at-home…. maybe not! I think it’s the smell of the wild. They love to be home, but once outside they get the call. But of course the pampering call is much stronger in the end. Spike goes off just to worry us, usually two days at a time, comes back very fat and heavy and sleepy…he’s been glamping with wild foraged dinner…..
Our cat, Jezebel, went missing for 4.5 days and then, luckily, the gardener who looks after the communal garden in our apartments, noticed her sitting at an upstairs window, locked in when an agent had entered to check the apartment and hadn’t noticed her presence. Got the key, unlocked the door, cat shot by without so much as a thank you, and headed to the feed bowl to start feeding her face. We figured she’d had access to the toilet bowl so had been able to drink water. What a relief! …exactly the reason why I leave the loo seat up when we go away! We do our heads in worrying about them don’t we?